+ Barton Springs is the place to be when it comes to getting out of the heat. If you are coming to Austin over the Summer, head over to this this natural pool. + Are you a runner or walker? Lace up and head to Lady Bird Lake Hike & Bike Trail or The Greenbelt . A perfect place to get a nice run or walk in and perhaps a little Paddle boarding. + Hiking? Mount Bonnell is a must see for a great Sunset. This spot has a great view over Lake Austin where there are other fun things to do. + Party Cove at the Lake? 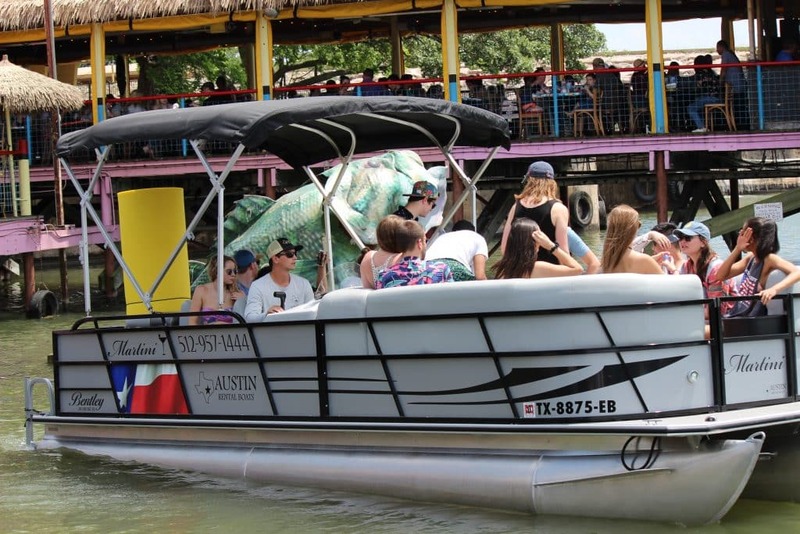 Rent a party boat with a captain from Austin Rental Boats. This is a very popular group activity for Bachelor and Bachelorette parties. Austin Rental Boats is a must to experience one of Austin’s best activities to do in 2018 in Austin. + This spot is one of Austin’s coolest restaurants for Sunday brunch (and bubbles, of course). Chefs Nathan Lemley and Sarah Heard are two of the most celebrated culinary talents in the city. The atmosphere is fun and hip — and you can’t beat their pancakes. + If you fancy Barbecue then add this to the Texas bachelorette party bucket list. For an quick lunch or dinner, check out the famous LeRoy and Lewis. This place is a barbecue food truck offering a selection of alternative cuts and creative sides. + Lala’s is a classic neighborhood bar. It’s located in North Austin at Burnet Rd and Justin Ln. If you want your Austin bachelorette bar experience to be as Austin as they come, then head to Lala’s. + $5 cover at the door, but once you’re in, you can buy a $20 bottle of champagne at the bar. This place is a fun place to go party. Barbarella. + Do you like County Dancing? Two places to check out then Donn’s Depotand The Broken Spoke . + Pre-drink at Midnight Cowboy. If your party is smaller than 8, make a reservation at Midnight Cowboy. This place has good cocktails with a chill atmosphere that will impress all your friends. Don’t plan to stay long as reservations only last 2 hrs.